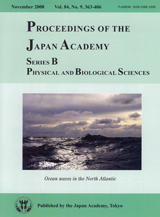 The photograph is a close-up view of ocean waves in the North Atlantic Ocean. The waves clearly show complex and multiple structures; there are various small-sized waves superimposed on a large dominant wave and the large dominant wave itself shows very complicated form which is much different from a sinusoidal form. Furthermore, if we look at such waves widely for a long time the waves change randomly with space and time. Until the middle of the twentieth century such a complex structure of ocean waves deterred scientists and engineers from studying their dynamics and from developing mathematical models. In fact, it is said that Lord Rayleigh (1842-1919) considered the mathematics involved in representing real ocean waves and remarked, “The basic law of the sea way is the apparent lack of any law”. On the basis of great many studies over more than half a century, we now know that ocean waves are composed of infinitely many wave components of random phases concentrated around the dominant wave components, and the wave components are interacting weekly through nonlinear processes. We generally measure the distribution of energy in wave components in terms of a ‘wave spectrum’. The concept of the wave spectrum introduced in the 1950s greatly advanced our understanding of ocean waves which show partly random and partly regular characteristics. There is another interesting but difficult problem on the ocean waves: their energy transfer processes. Ocean waves are generated by sea surface wind through a complicated process of energy transfer from the wind to the waves. On the other hand, the ocean waves loose a part of their energy through wave breaking. Furthermore, wave components exchange part of their energies through nonlinear wave-wave interactions. Therefore, in order to predict the ocean waves under the wind action we need to know these fundamental processes. Although there still remain various difficult problems in these fundamental processes, our understanding on the processes has been greatly advanced. On the basis of such advancement, Professor Yoshimi Goda and many engineers have endeavored to develop and refine the technology for dealing with wave actions on structures. The review in the present issue describes the development of engineering applications of the random wave concept for planning and design of maritime structures in the last several decades. The review can be regarded as an example of successful collaboration between scientists and engineers. This cover photograph has been used by Y. Goda "A review on statistical properties of sea waves" (Proc. Jpn. Soc. Civil Eng. 357, 1985) and H. Mitsuyasu “Looking Closely at Ocean Waves -from their birth to death-”(Iwanami Shoten Publishers, 2007).